Two of the best gaming consoles available right now are on sale at discounted prices, along with some additional cashback. Gaming laptops and monitors are also available at reduced prices. Friday can now be unofficially considered as the day when e-commerce platforms offer gaming gadgets at a discounted price. 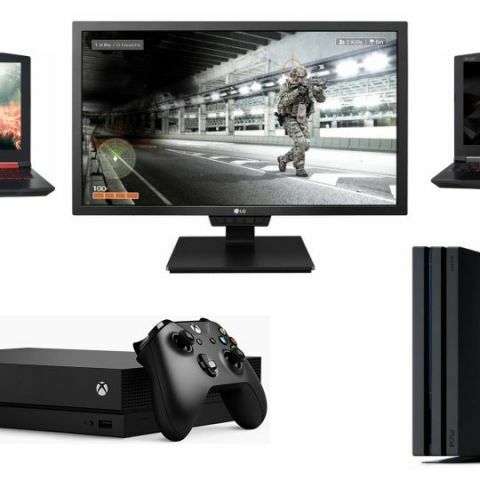 Today, we have rounded up some of the best value for money deals on some of the best gaming consoles, laptops and monitors. The 1TB Sony PS4 Pro console comes with more powerful internals than its predecessor with the 2.1GHz 8-core AMD Jaguar CPU, coupled with a 4.2 TFLOP AMD Radeon GPU. It comes with 8GB GDDR5 + 1GB RAM. It features 3x USB 3.1, 1x Gigabit Ethernet, 1x PS Camera, Optical Audio output, and an HDMI 2.0 port. The recently launched Xbox One X is on sale with a 10 percent discount and can be purchased priced at Rs 43,470, along with a Rs 5,000 cashback. The console supports gaming at 4K resolution and also doubles as a Blu-ray player. The PS4 console is being offered at a discounted price, along with a Rs 3,208 cashback. It also comes bundled with the Uncharted 4 and The Last of Us gaming titles, which are some of the best games available. The Samsung curved LED monitor features a 26.5-inch display and boasts of a 4ms response time. It features a full HD display resolution and covers 72 percent of the colour gamut. The 24-inch LG gaming monitor features a 144Hz refresh rate and comes with a 5ms response time and 1ms motion blur response. It supports full HD display resolution and has a three year manufacturer warranty. If you are on a lookout for a budget gaming laptop, the Acer Nitro 5 is up for grabs after receiving a Rs 5,000 discount and it can now be purchased at Rs 52,990. Customers will also get up to Rs 14,000 off on exchange. The MSI P Series PE627RE-2024XIN gaming Laptop is powered by the 7th Gen Core i7 7700HQ processor and comes with 4GB RAM with 128GB SSD internal storage. It comes with the Nvidia GTX 1050Ti GPU and a 1TB HDD for taking care of storage needs. The Acer Predator Helios 300 is equipped with the 7th gen Core i7, coupled with the Nvidia Geforce GTX 1050 Ti. It comes with a 128GB SSD and 8GB RAM.